Warkworth Castle was built in the 12th century as a fortification against the marauding Scots. In the 14th century it passed into the hands of the powerful Percy family of Northumberland. It stands in an imposing position atop a precipitous hill. A short distance from the castle hidden away on a heavily wooded river bank are the remains of a hermitage, carved in the rock. It consists of a chapel and living quarters and is a beautiful lonely place which can still be reached by ferry boat. 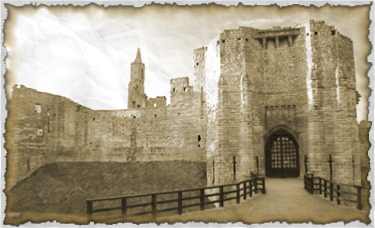 This place along with the castle itself will feature in the tragic tale of the ghost which is said to still haunt Warkworth Castle and estate. Bertram de Bothal of Bothal Castle fell in love with a beautiful lady named Isabel Widdrington and although she felt attracted to the young man, she wanted to see more proof of his love for her and so she presented him with an engraved helmet and she told him that if he would wear it bravely in battle then he would have her hand in marriage. Shortly after Bertram had his opportunity. Lord Percy crossed the border pursuing Scottish raiders and in the ensuing battle Bertram fought courageously but was very seriously wounded and taken back to England to recuperate. Isabel on hearing the news felt very guilty about her foolish challenge and set out with only a single manservant guarding her to reach him and nurse him better. After a week passed, Isabel still had not arrived and although Bertram was not fully recovered he left his bed and set out with his younger brother to search the Borderlands for her. Crossing the border into Scotland, they decided to go in different directions to cover a wider area. After a few days, Bertram learned that Isabel was held prisoner in the castle of a notorious border raider and he hurried to the castle which he spied upon from nearby. On the second night of his vigil, he was awakened by voices and saw a woman climbing down a rope from the tower and a man dressed in tartan helping her. Recognizing the woman as Isabel, Bertram followed the couple away from the castle and then confronted them demanding that the Scotsman should release Isabel. In a rage, Bertram struck out at the man who fell to the ground without being given the chance to reply and when Bertram raised his sword to strike again, Isabel flung herself between them and received the full force of his sword falling mortally wounded before him. Isabel used her dying words to explain how Bertram's brother had disguised himself as a Scot and had arranged for her escape from the castle. It was his own brother that he had killed! Desperate with grief, Bertram returned to Northumberland where he was granted sanctuary by Lord Percy at Warkworth Castle. After a while, Bertram renounced all his wealth and possessions and left the Castle to build the hermitage nearby, carving the chapel out of the rock face. It is here that he spent many lonely hours in prayer and meditation until his death. Into the chapel rock he carved the following in Latin: 'my tears have been my meat by day and by night'. Not surprisingly it is the inconsolable ghost of Bertram de Bothal that still haunts the hermitage and castle to this day.